The interior of Mars holds vast reservoirs of water, with some spots apparently as wet as Earth's innards, scientists say. The finding upends previous studies, which had estimated that the Red Planet's internal water stores were scanty at best — something of a surprise, given that liquid water apparently flowed on the Martian surface long ago. "It’s been puzzling why previous estimates for the planet’s interior have been so dry," co-author Erik Hauri, of the Carnegie Institution of Washington, said in a statement. "This new research makes sense and suggests that volcanoes may have been the primary vehicle for getting water to the surface." The scientists examined two Martian meteorites that formed in the planet's mantle, the layer under the crust. These rocks landed on Earth about 2.5 million years ago, after being blasted off the Red Planet by a violent impact. Using a technique called secondary ion mass spectrometry, the team determined that the mantle from which the meteorites derived contained between 70 and 300 parts per million (ppm) of water. Earth's mantle, for comparison, holds roughly 50-300 ppm water, researchers said. 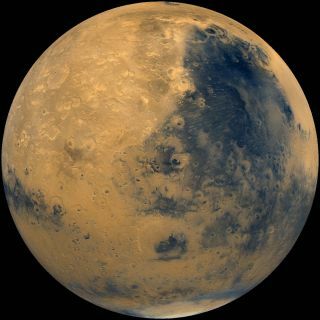 "The results suggest that water was incorporated during the formation of Mars and that the planet was able to store water in its interior during the planet’s differentiation," Hauri said. Some of this water apparently made its made to the surface in the ancient past. NASA's Spirit and Opportunity rovers, which landed on the Red Planet in 2004, have found plenty of evidence that Mars was far warmer and wetter billions of years ago than it is today. The two golf-cart-size robots have even spotted signs of ancient hydrothermal systems, suggesting that some places on the Red Planet once had both water and an energy source — two key ingredients for the existence of life as we know it. While the new results should help scientists better understand Mars and its history, they could also shed light on the evolution of large, rocky bodies in a more general sense, researchers said. "Not only does this study explain how Mars got its water, it provides a mechanism for hydrogen storage in all the terrestrial planets at the time of their formation," lead author Francis McCubbin, of the University of New Mexico, said in a statement. The study was published in the journal Geology on June 15.